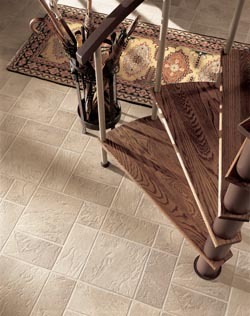 Replace the worn and faded floors in your kitchen with an innovative product from Cloister Flooring America. Our team is ready to ask you the critical questions about your project so that we can suggest a floor covering that suits your needs. When you want the charm and character of hardwood flooring in places like your basement and bathrooms, the solution is luxury vinyl flooring in Ephrata, PA.
Natural wood floors are an excellent option for many of the rooms in your home, but hardwood is not recommended in places that experience higher levels of moisture. When you visit our flooring store, we provide you with a series of recommendations that match your budget and your way of life. Our flooring store carries both tiles and planks that feature an advanced photo wear layer. The manufacturing process provides a floor that features the performance of vinyl and the appearance of traditional hardwood, slate, and stone. Your ordinary bathroom and kitchen can become a destination when you choose from our extensive selection of vinyl flooring products. We carry floor coverings from many of the leading names you know and love. Our 5-Star Selection System helps the customer identify a flooring product that includes the guarantees and installation warranties they need. Our flooring specialists are ready to identify a product that can withstand the scrapes and spills that come with an active family. While many believe they must sacrifice the look they want for the performance they need, luxury vinyl provides them with both. Hire a proven professional for vinyl flooring installation, and enjoy a surface with functionality and appeal. We go the extra mile to ensure your flooring choice is installed properly, so you won’t have to worry about repairs down the road. You won’t feel as much strain after spending all day standing on our vinyl flooring. Each tile and plank provides you with greater give, and they retain their color for years to come. Protect the subfloor below your remodeled kitchen and get the most value from your flooring investment when you choose the right contractor for vinyl floor installation. Luxury vinyl tile is designed to withstand spills and resist fading for many years. A properly installed vinyl surface acts as a barrier that protects the subfloor and helps you to avoid a mold or mildew infestation. Choose a luxury vinyl plank product that absorbs louder noises and footsteps. Newer floors can also make a difference when you are putting your home on the market for sale. Your home will become more attractive when matching your existing décor to one of our vinyl flooring products. Contact us today for focused design assistance and stunning luxury vinyl flooring. We proudly serve customers in Ephrata, Denver, Akron, Brickerville, Adamstown, Pennsylvania, and the surrounding communities.